Leskylor are among the natural fauna of the Blessed Fields of Elysium, making their homes in the caves nestled in wind-shorn peaks. Leskylor are prone to a particular type of mutation, that of multiple heads. Up to three-headed Leskylor have been spotted by dimensional travellers in Elysium. Which of course makes them all the more dangerous, as even a one-headed Leskylor is able to breathe out cones of bitter cold. 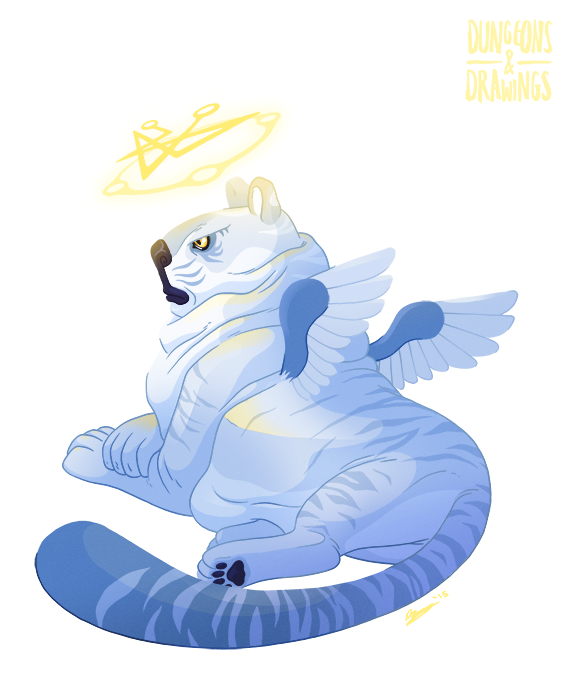 These blue winged tigers are as independent as their ordinary mortal cousins, but vastly more intelligent and a useful ally against the forces of evil. They have a number of heavenly abilities which let them unearth any hidden evil-doers and move them to (temporary) repentance. If I'm honest, I just wanted to draw a fat tiger, really. Also, we've (finally) purchased a copy of the 5th Edition D&D Player's Handbook, and while it's really simplified down, it does still seem appealing to me. Especially the artwork. The art's crazy gorgeous in this book. A big reason why I didn't get into 4e D&D is just the artwork in the Player's Handbook was not really my cup of tea. Maybe it improved in future books, but I wouldn't know. Let me tell you though, if they release the Dark Sun setting for 5e, I will definitely definitely be running some of that. We play mostly Pathfinder in our group, though I do want to branch out into other systems. We've already experimented with the Savage Worlds' Deadlands: Reloaded setting (mixed results, but I really like the setting), and the next time I get to DM, I'm running a Call of Cthulhu game. Although it just illustrates my luck that I go out an purchase the 6th Edition Call of Cthulhu handbook when 7th Edition is about to come out and is apparently the one that's making the most changes to the actual rules of the game. Have also been eyeing with some interest Legend of the Five Rings, Numenera, The Strange and Nobilis. Must hold off though, as I have limited time to play and also limited shelves to put books on. And pdfs are nowhere as nice as material books. Anyway as I was saying, 5e Dark Sun plz.